I didn’t mean to do it. I know I should not have done it. Every week I carefully avoid looking but this Friday I did. I don’t know what possessed me. I put it down to mid-life crisis. My eyes just wandered and there it was, the most enticing, the most tantalizing, the most tempting job offer I have ever read in the Church of England Newspaper. “It’s True Adelaide is a great place… No doubt you’ve read about Adelaide’s fine weather, fine beaches, fine food and fine wine. Its all true! South Australia wants people who see their future in its progressive climate. The archbishop of Adelaide welcomes enquiries from clergy wishing to minister in parishes and schools. Find out more about South Australia at www.southaustralia.com. Send your expressions of interest to…” and then it gave the address. Interestingly, the advert said nothing about what they were looking for in candidates, nothing about what the role required. It didn’t need to. I confess that purely out of curiosity I visited the website of www.southaustralia.com . Yes I did and it is true. Then reality caught up with me. I remembered my age and my heart sank. And my soul yearned to be 20 years younger… If only… Do you ever do that? Do you ever feel life has passed you by? Do you ever feel over the hill? That you have had a raw deal? That you have been short-changed? That time is running out? Like the sand in the egg timer? If only you could turn it upside down and start again? Well you can – kind of! Because of Easter. Because the death and resurrection of the Lord Jesus Christ has radical implications for the way we view the future. For the way we view life and death. Lets discover how the resurrection of Jesus transformed the lives of his followers. How he gave them peace of mind. A sense of fulfillment from knowing and serving his purposes. And what he wants to say to use today too. The disciples were afraid. The word “fear” in verse 19 carries with it the idea of “flight.” The disciples were so alarmed and frightened that they wanted to run. Now, contrast this with the word, “peace,” which means “putting together that which is broken.” Jesus knows they are afraid so He says “Shalom” to them, which literally means, “All good to you.” He came to bring good to them – peace. The cross is the sign of peace, the cross is the means to peace. Jesus comes to them and reassures them. He shows them his wounds. They were to be sure it was Jesus and not another person. Not a ghost or apparition. Do you understand that Jesus wants to extend peace to you and I as well? He doesn’t gloss over your past. He is well aware of the mistakes we have made. He knows how we’ve scorned Him, denied Him, and rejected Him when we should have been speaking up for Him. Yet He still extends peace. When He sees you He says, “Shalom.” Jesus gives his peace to live in. The first use of the word “peace” in verse 19 was given in order to quiet their hearts. This second “peace” was given in order to prepare them for their role. Jesus reminds them what he had said that the Last Supper “As you sent me into the world, I have sent them into the world.” (John 17:18). He not only restores them but He entrusts them as his Ambassadors. Jesus said, “As the Father has sent me, I am sending you.” (John 20:21) In his book The Purpose-Driven Church, Rick Warren reports on a survey that found 89% of church members believe the church’s purpose is to “take care of my needs and those of my family.” Only 11% said, “The purpose of the church is to win the world for Jesus Christ.” Jesus said, “As the Father has sent me, I am sending you.” (John 20:21). We need reminding that mission is our first priority otherwise we experience what Mark Mittelberg calls the “second law of spiritual dynamics.” Left to ourselves we move toward self-centeredness. Jesus gives his peace to live in and his purpose to live by. We usually think that the Day of Pentecost was the birthday of the church. It wasn’t. It was more like her baptismal day. Easter was the birthday of the church, when the Apostles met Jesus and received the Holy Spirit. 50 days later at Pentecost, the power of the Holy Spirit enabled them to be witnesses of Jesus. If you sometimes feel a little overwhelmed when prompted to bring Jesus into a conversation, remember Jesus not only calls, he also empowers as well. We need his presence and power too. Listen to what the Bible says the Holy Spirit will do. When we give the Holy Spirit room to work He will surprise us again and again by what He does best. We are not alone. God doesn’t call the equipped; He equips the called. John’s intention is that we experience the same relationship with God through Jesus Christ as the Apostles had. When Jesus says, “blessed are those who have not seen and yet believe”, it is a word for us. It is not necessary to see Jesus in order to believe. It was necessary for the apostles to see him. It was a great blessing for the first Christians to see the risen Jesus, to know that he was alive; but that is not what saved them. They were saved not by seeing but by believing what they saw. They saw, believed and testified, risking there lives to do so. We are saved by believing what they saw. The resurrection was like the final piece in the jigsaw of God’s progressive revelation. There was the evidence of the Old Testament scripture prophecies pointing to Jesus. 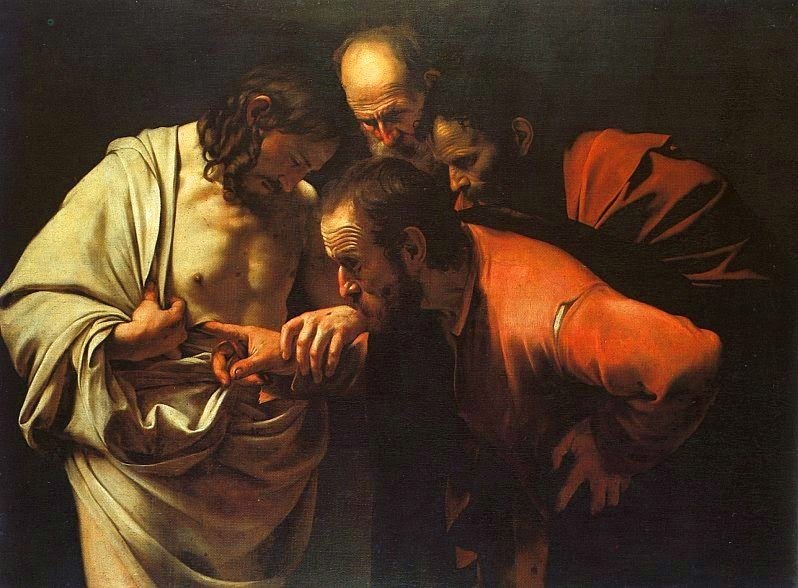 There were the miraculous signs and wonders which Jesus performed as proof of his divinity. There were the eye witness testimonies of those who saw him die and rise to life the third day just as he said he would. We believe by taking God at his word, and by placing our trust in Jesus, we experience the life that he promises. There was and is an energy which flows from Jesus, like a wind blowing, like running water, like light shining, a power which transforms the self consciousness of men and women. This energy is called ‘anastasis’ in Greek. The word ‘resurrection’ comes closest to it. On that first Easter day the disciples were transformed from fear to courage by meeting Jesus. A week later Thomas was transformed from unbelief to confidence. And that was just the beginning of the Church. The Apostle John also wrote a letter to reinforce the message of his gospel. In it he explains his reasons. The resurrection of Jesus provides a glimpse of all God intends for us. The resurrection of Jesus gives us hope of who God is and what God will continue to do in us and through us. Through the resurrection Jesus gives his peace to live in, his purpose to live by and his power to live on. Today, God the Father calls you to trust His Son, the Risen Lord Jesus Christ and let Him transform you by the power of His Spirit, from someone who is living to die into someone who is dying to live. I am grateful to Richard Tow and Brian Bill for some of the ideas and illustrations used in this sermon. This entry was posted in Anglicanism, Bible, Easter, Sermons on April 8, 2018 by Stephen Sizer.